19th century witnessed the Golden Era of music and arts in Travancore. It was the period of Sri Swathi Thirunal Rama Varma (April 16, 1813 – December 25, 1846), the Maharaja of the state of Travancore in India. He was a patron of music and was an excellent musician himself. Swathi Thirunal encouraged both Hindustani and Carnatic music, though he was essentially a maestro of the Carnatic music tradition. He is credited with composing over 400 compositions in Carnatic and Hindustani music. Here you can listen to some of his enchanting compositions in K.S. Chithra's ethereal voice. 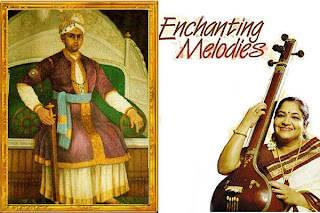 These songs are from the album titled 'Enchanting Melodies'. If you like the songs, you can buy the album from Flipkart.com directly from here. Click on the link given below and you will be redirected to the page.